20 months old...how did we get here so quickly? I look back to pictures and videos of Camden just from a few months ago and am honestly shocked at how much he's grown (and learned) since then. Everyone warned me I would feel this way once Grayson came along. 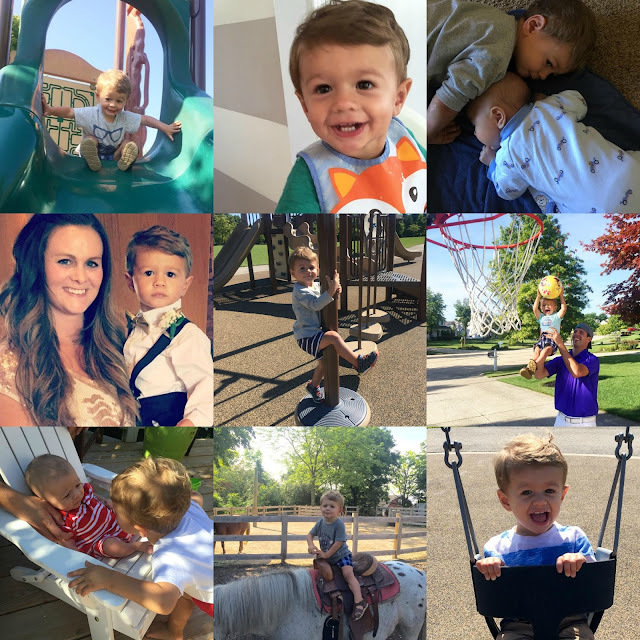 In a few months, which I'm sure will feel like weeks, he will be TWO!! He's developing his own little (or big) personality and is constantly surprising us with how much he's learning and picking up on a daily basis. But don't get me wrong, it's also a really challenging age too as the tantrums are already in full force and he wants to be on the go pretty much all the time. It's an exhausting type of love I've never experienced before that I wouldn't change for the world, even on the hard days. -became a big brother! Can't stress enough how proud we are of him. He is so loving towards Grayson and we've only had a handful of times where we really have to watch how rough he is with him. One time he tried sitting on Grayson because he wanted to hug him, but besides that he is very gentle towards him. -COMPLETELY done with his pacifiers...he was only getting it in his crib for naps/bedtime but he started biting through them so we used that as a way to say "uh oh-it's broke!" and that he's a big boy now and doesn't need them anymore. He whined one night for it (but he's also cutting teeth so not sure if it was because of that or because he missed paci) but that was it! So proud of him! -first pony ride at the zoo! -his obsession with his vitamins. anytime I open the cabinet that has them in them he says "vitamins! vitamins!" And all of this makes me realize how much of a little toddler he is now....big sigh! Love you, our handsome Cam!